To view videos click on service link. Delivery to your door of a hot nutritious noon-time meal means daily contact with a volunteer to help you stay safe and well in your own home. Prince Edward Community Care offers both hot and frozen meal to seniors, those who are recovering from an illness and clients of Hospice Prince Edward or the Alzheimer Society of Prince Edward County. For Meals on Wheels for yourself or to refer someone, call 613-476-7493. Staff can make home visits to explain this and other services. 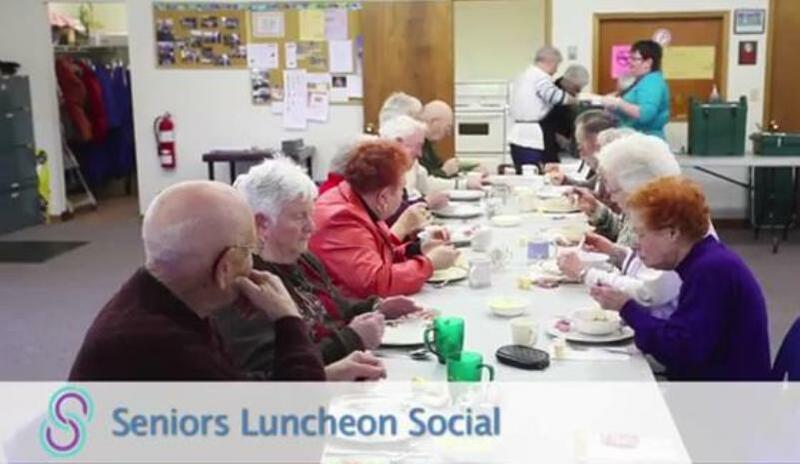 Community Care's, Seniors Luncheon Social are held in Picton, Milford, Consecon and Wellington. Wheel House and Occasions Catering prepares a wonderful home-cooked meal, including soup and dessert for $10.00 per person. Dates for each location are advertised in the Picton Gazette. Reserve your place by calling 613-476-7493. Seniors are asked to bring their own soup bowl, plate, cup and cutlery. If you can't come to the hall for this meal it can be delivered to shut-in seniors who live in Picton. If you wish to have a take-out meal please advise when you register. The price is the same for take out and eat in. If you have trouble trimming your nails or are concerned about your foot care call Community Care. Professionally trained nurses provide foot care at clinics in Picton, Wellington and Rossmore. Call for an appointment at 613-476-7493. Prince Edward Community Care offers an escorted transportation program that can maximize your independence with affordable rates, punctuality, personalized service and friendly drivers. Whether you need to travel locally or out of town, this service gets you where you need to go. The volunteer waits while you're in the appointment. Call Community Care at 613-476-7493. If seniors are isolated and need some encouragement and support, Prince Edward Community Care can match them with friendly volunteers for visits in the home. To sign up for this program, or refer someone, call Community Care at 613-476-7493. Prince Edward Community Care's staff will help seniors with paperwork for Federal or Provincial programs such as Old Age Security, Spouse's Allowance, GAINS, Guaranteed Income Supplement, Income Tax, etc. Appointments are necessary. Income tax forms are also completed for eligible seniors. Call Community Care at 613-476-7493. A short call each day can help maintain independence. Prince Edward Community Care has supportive volunteers that can offer companionship, encouragement and a warm friendly call to seniors to help alleviate loneliness and help keep people safe. This service is provided at no cost. In partnership with Canada Post and the Canadian Union of Postal Workers, Prince Edward Community Care can arrange for your mail courier en route to keep a watchful eye on your home to help keep you safe. This service is free, offering added safety and security to those living in the country. To participate in this service, call Prince Edward Community Care at 613-476-7493. A great refresher course in preparation for upcoming license renewal. 55 Alive Driving courses developed by the Canada Safety Council, to help older drivers improve their driving skills are held at various times throughout the year at our Prince Edward Community Care office. Call Prince Edward Community Care at 613-476-7493. Prince Edward Community Care for Seniors has a great way to maintain your mobility and socialize at the same time. Walking programs and Tai Chi offered by Prince Edward Community Care can help you achieve this. Call 613-476-7493. Prince Edward Community Care's knowledgeable staff can help you find services you need to live at home or if it's finding information that you need, we can help with that too. We welcome any and all questions. Call 613-476-7493. For caregivers who need a safe person who will spend time with a senior when you need a break. Prince Edward County Community Care maintains a list of Respite workers who will stay with a senior, for an hourly fee. All Respite workers have been vetted, to ensure they are safe and reliable. Call Prince Edward Community Care for Seniors at 613-476-7493. The knowledgeable staff of Prince Edward Community Care are willing and able to talk to caregivers to support the caregiving role. Group or private discussion with staff is available. Call 613-476-7493 to make an appointment.